Hoe hoe grow: The things that work ... and the things that don't! The things that work ... and the things that don't! Sometimes, only sometimes, when you garden, everything seems to come out right, and you can be fleetingly satisfied with your efforts, and send thanks to the Gods of Garden Things. 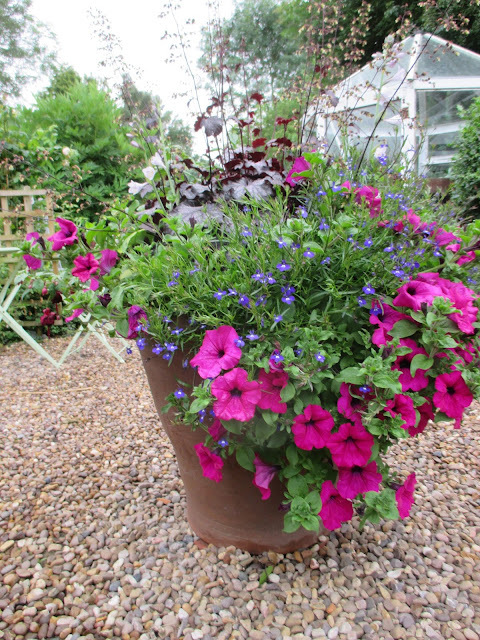 In early June, The Exotic Gardener planted up our new pot with hostas, dark Heuchera 'Purple Palace', blue Lobelia and pink petunias. 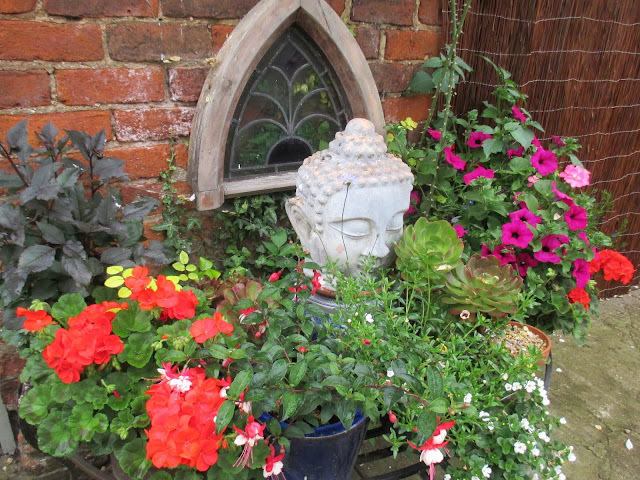 To my eye, it all works well with the dark terracotta. May I say that the Exotic Gardener assures me that this was totally planned and not accidental. How I wish everything in the garden had that same planned synchronicity! No subtle colour co-ordination here ! Magenta and lime green would be zingy and fine, red and lime green would be zingy and fine ... red, magenta and lime is just an explosion in a paint factory! The red and the magenta work against each other, and are not an easy colour combo to look upon! The combination above is part planned and part happy accident. Rose 'Joi de Vivre' (Rose of the Year 2011) sits well with the dark foliage of dahlias, the mottled mauve tones of Erysimum 'Spice Island' , cosmos and the raspberry of Digitalis Illumination 'Raspberry' and Illumination 'Pink'. The two Illuminations have been fantastic this year, flowering like rockets and bulking up quickly. 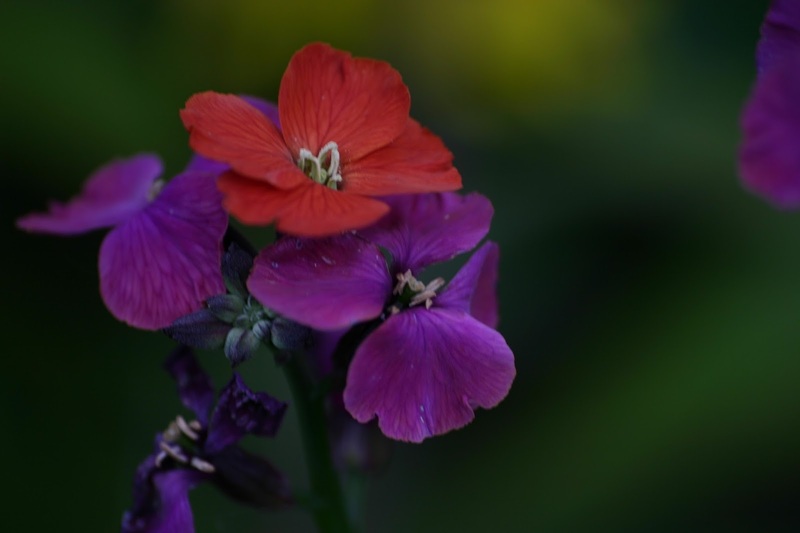 Erysimums are just the best, and they have all been flowering for 3 months straight. 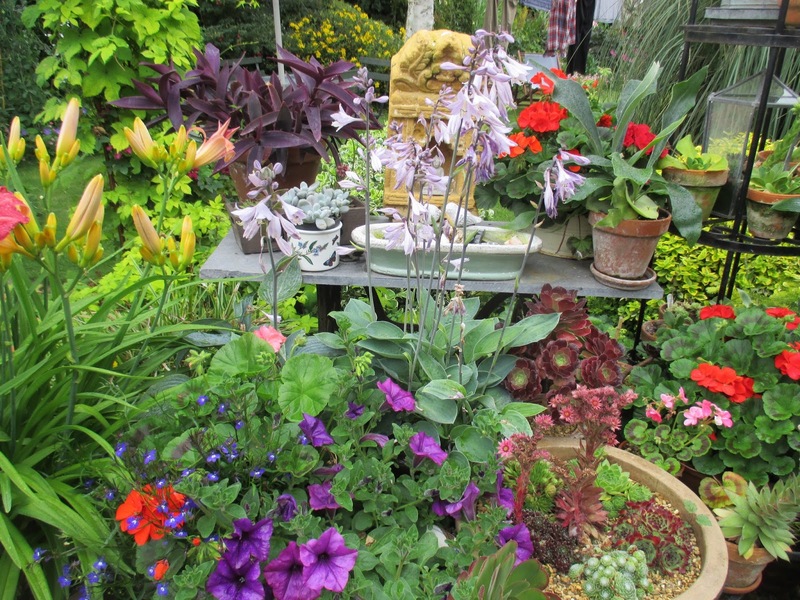 The foliage above is comprised of Spirea 'Gold Mound', Hosta 'Sieboldiana', Dahlia 'Bishop's Children' and a tiny bit of Melianthus Major in the bottom right hand corner. I like the contrast in colours, shape and texture. Did I plan it ? 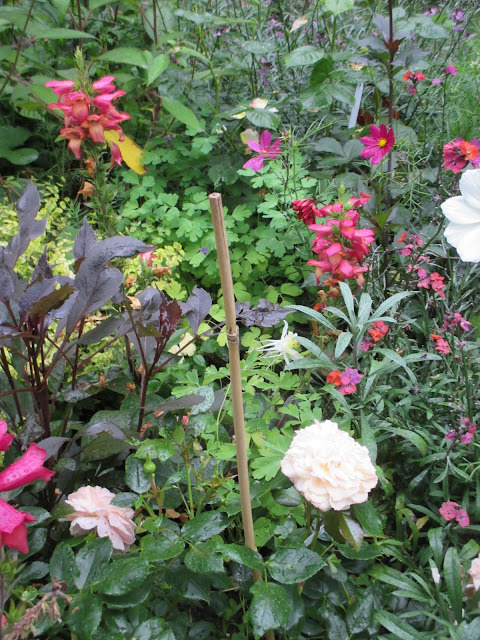 No, I just wandered up and down the garden one day with an armful of plants, looking for a place to plant them. One of my happier accidents! I grew lots of Melianthus Major from seed this year as an experiment. 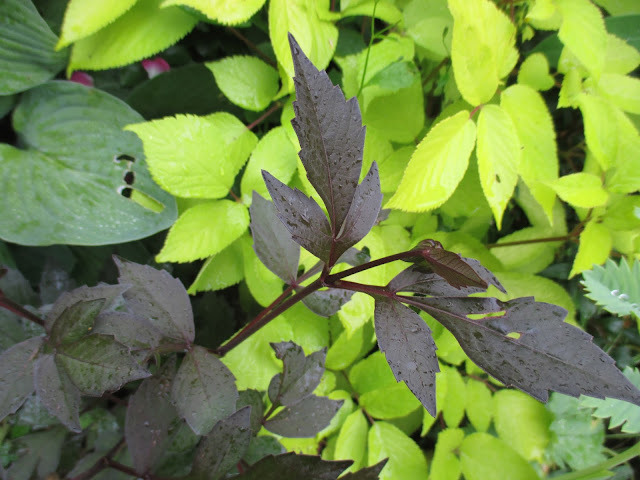 They are lovely textural plants, with their deeply serrated leaves, and the soft grey of the foliage is a good foil to many other plants in the garden. the plants are growing well and bulking up, but I am unsure of how they will overwinter. I know they are quite tender so I may dig up half, to overwinter in the greenhouse and let the others take their chance. Now, this this is totally my fault! I got loads of geranium plugs in Spring to grow on in the greenhouse, then promptly forgot what colour they were ! 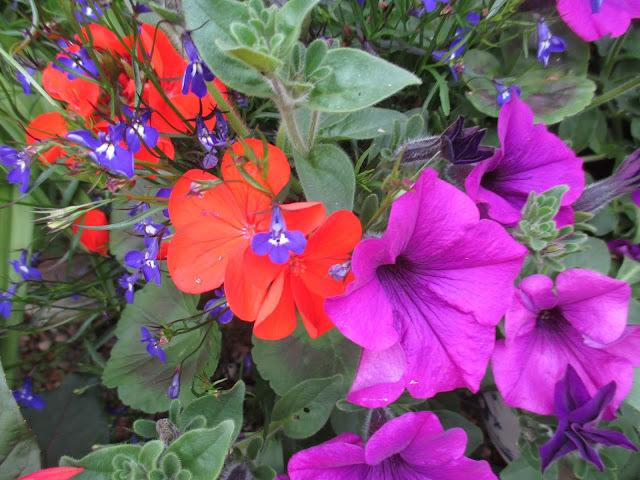 They began to flower after the purchase of the other, carefully co-ordinated bedding, chosen in tones of pinks, blues and purples ! Pesky red ! There is something about red which draws the eye like a magnet and seems to overshadow every other colour. Cool, elegant Purple , unsullied by any other colour, then ... oh no ...!! Like the Scarlet Pimpernel, that pesky red has sneaked in again! 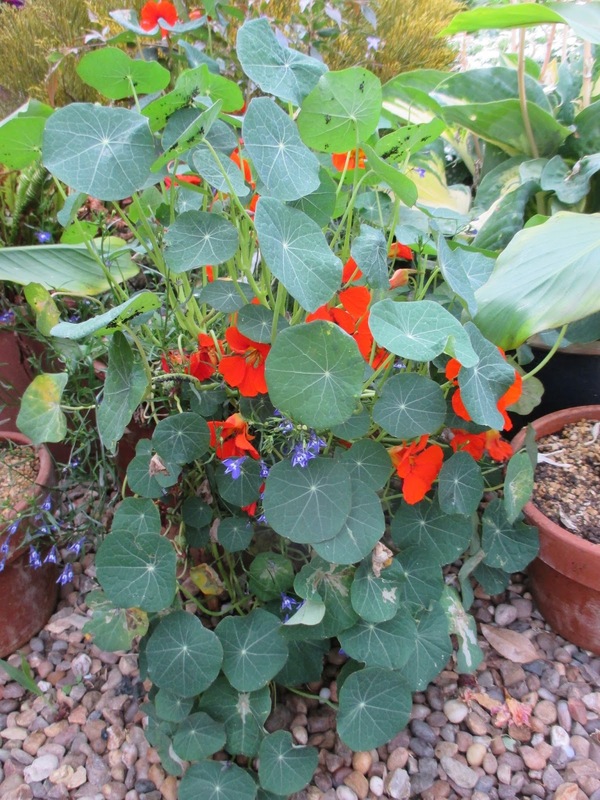 I decided to grow nasturtiums this year, for the first time, as I had seen some varieties in the seed catalogues, which looked interesting. Whilst I have never been a big fan of the bright orange ones, I had spotted 'Empress of India' which supposedly has dark flowers and foliage . Did they turn out dark and interesting ? No, of course not ! They have huge pale green leaves and very few (thankfully`) bright orange flowers. What could have gone wrong! They do not resemble the photo on the seed packet in any respect. And, they are, naturally, the most rampant plant in every pot, swamping anything more subtle and interesting with their stupid leaves and neon flowers. Ah, every year there are so many lessons to learn. Every year is different in the garden, and there are always surprises, disappointments and unexpected pleasures. I'd love to hear what your triumphs ... and failures have been so far this season. Dear Jane, I so agree with your observations about the color red! That is why I have no red in my garden ;-). 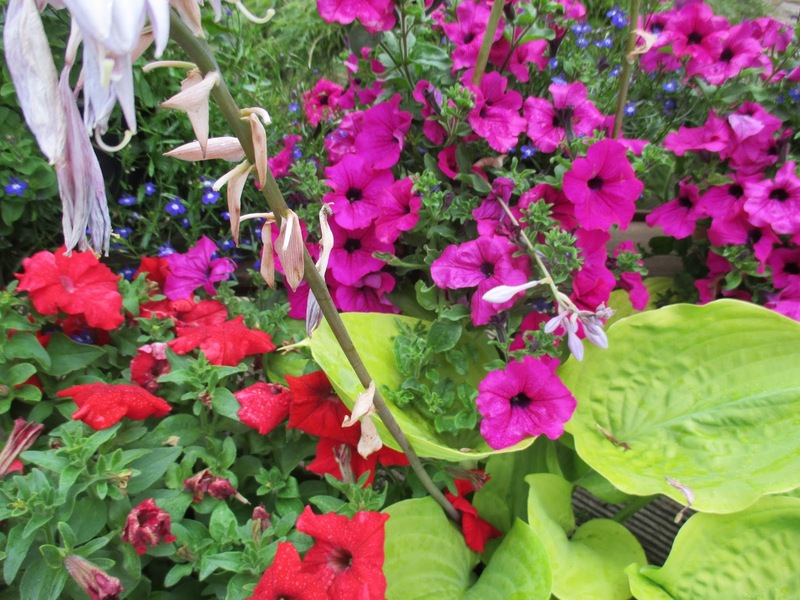 I am very color coordinated in my own yard, but I have seen it more than one time in other people's gardens that when you combine all colors regardless, it seems to work again. I am pleased this year with my White Garden Bed. Even though I am trying to use only white in this bed, there are warm whites, gray whites, cold whites and even these very similar colors can really bite each other, but so far I am lucky and I think it works well. Wishing you a nice rest of the weekend! We are never satisfied are we ? As soon as we have got it all in place for the season we start planning and making changes! I have been digging things up and even moving them as the soil is so wet and the temperature SO low! Melianthus is a hit or miss sort of plant when it comes to hardiness. 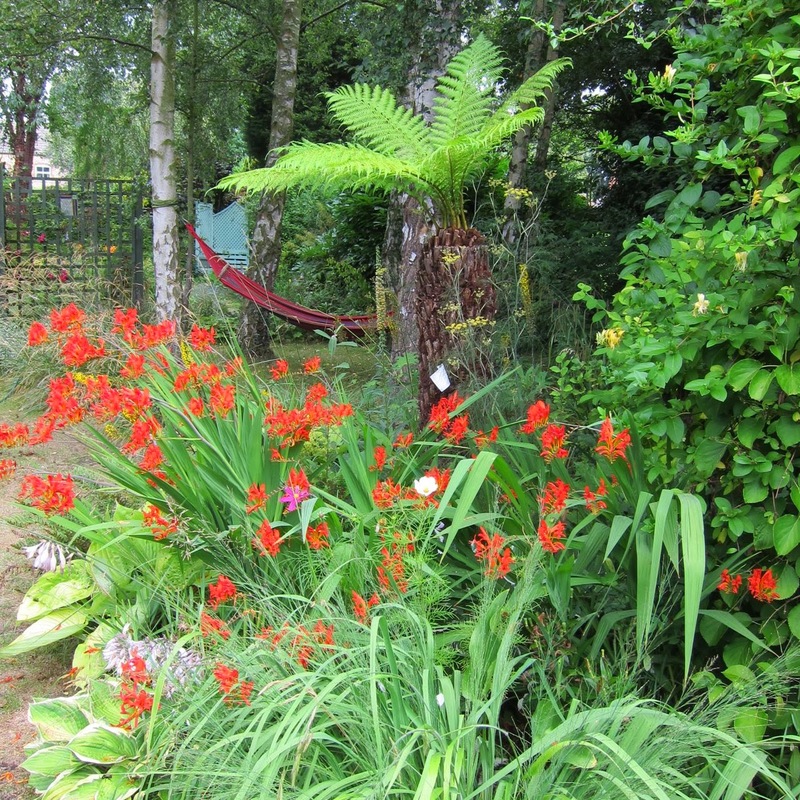 The exotic gardener have done a fine job! That is interesting! Do you lift all yours every year or grow from seed ? They make decent sized plants in one season. Our new red and yellow bed has been surprisingly beautiful this year. Although the coming down with a bad case of mildew was disappointing. I expected it to take its time before bulking up and producing a display. Last year our blue and white bed was a bit of a disappointment that it has rallied this year too. Ah Sue, you are colour co-ordinated ! Bet they look gorgeous! Will pop over to your blog to see for myself !! You have to take risks Jane and not play too safe, then when it is successful you will become the next 'Christopher Lloyd'! Now, there was a daring and brilliant gardener ! One of my favourite gardens to visit! I usually enjoy red flowers, but this year, my red Pentas just aren't the right shade of red to complement the other flowers in the sun garden. 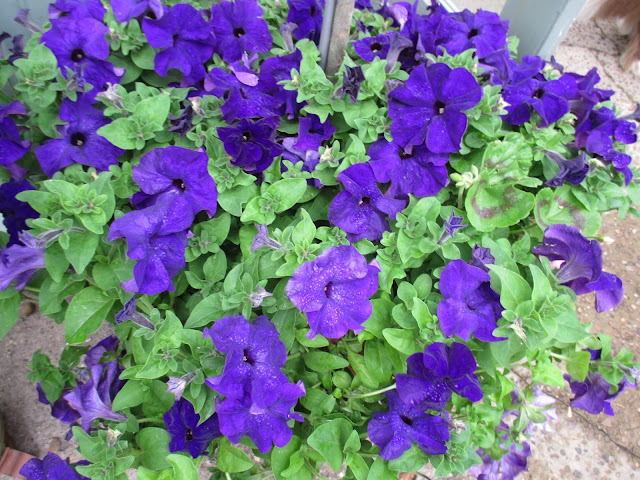 Next year, I'll try to find a different colored Penta, if I plant them again. 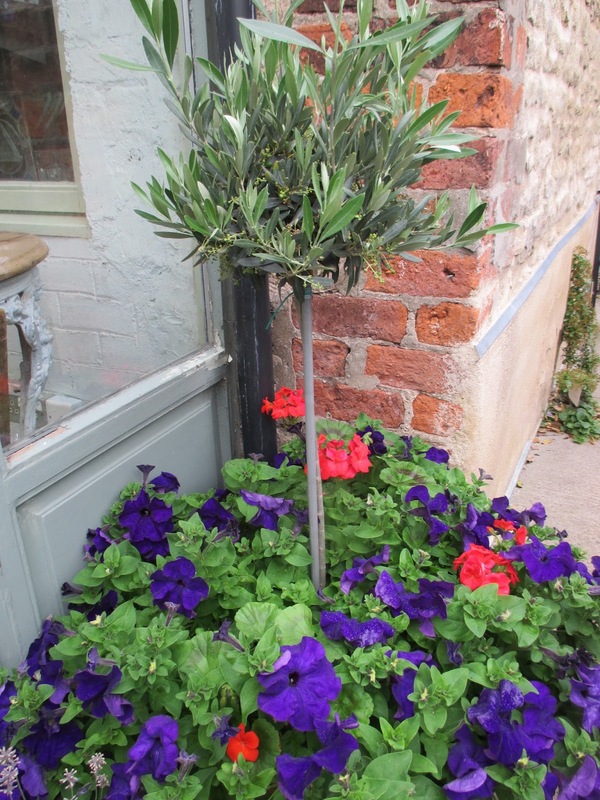 I really like your foliage example--great combinations! I think you have hit the nail on the head, so to speak! The shade of red is so important, more than with other colours I think. I guess because it is such a bright statement colour anyway! Yes Tammy I agree - joyful is absolutely the point ! That jumble of colour does lift my heart ! Sometimes self seeded stuff is just the best. I think red looks great at this time of the year. By the end of July we need a bit of zing. Your pots are lovely even the ones with red. I always take the credit when things accidentally turn out right. Who' s to know any different? 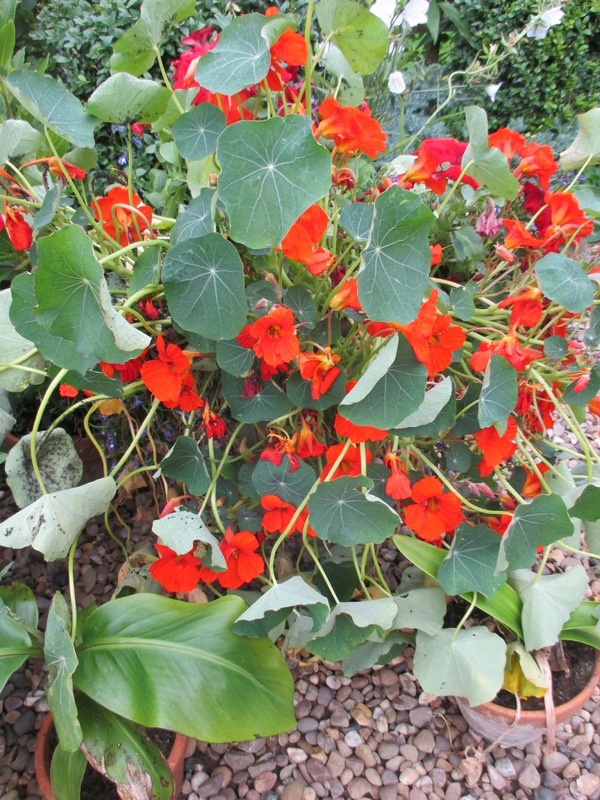 What have you got against Nasturtiums? They are rather jolly. Try picking them, they are nice in a vase. I didn't realise they made good flowers to cut Chloris.I will have to try. The colour palette changes all by itself at this time of year to those zingy colours, and it really signifies high summer. The dahlias are really coming into their own now and I love those rich solid colours.